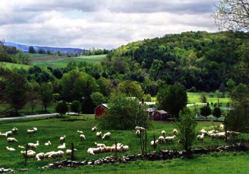 On September 15 and 16, members of the Upper Hudson Farmstead & Artisanal Cheesemakers are opening their operations to the public, giving people a chance to meet the cheesemakers and watch them as they craft some of the best farmstead cheeses in America. Visitors will also be able to meet the beautiful sheep, goats and cows that make all the precious raw milk for the cheeses. The five farms participating are Three Corner Field Farm, Argyle Cheese Factory, Consider Bardwell Farm, Longview Farm and Sweet Spring Farm. The tour is self-guided, and people should feel free to visit at any or all of the cheesemakers over the course of the two day event. Follow this link for a brochure that includes descriptions of the farms as well as a map that will get you where you need to go. For more information, contact Sandy Buxton at 518-746-2560 or 1-800-548-0881 or visit cheesetour.blogspot.com.